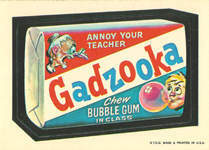 Wacky Packages were those cool Topps bubble gum stickers that made fun of supermarket product brands and commercials of their time. I remember buying Wacky Packages for 5 cents a pack at the local convenience store (7-Eleven) when I was a kid back in the 70�s, collecting and trading them with friends. 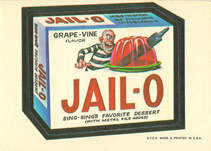 Wacky Packages were so popular back then. I used to see them stuck on lunch boxes, notebooks and bikes at school. They are fun to look at, fun to collect and really bring back memories of products that defined a great era. While most of you probably remember the wacky packs of the 70�s (the original series), it is important to know that wacky packages actually dated back to 1967 and that Topps continued to produce and market them well into the 1990�s! There is more to wacky packs then just the stickers too. There are non-sticker items like posters, tattoos, patches, banks, clothing, jewelry and other Wacky Package related merchandise sold over the years. Today there are still many people collecting Wacky Packages which has recently become much easier through online auctions and wacky pack web pages. The internet has also provided us with more information about Wacky Packages then was ever known before. 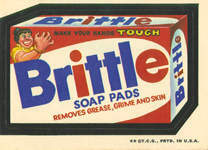 Wacky Packages are increasing in value as many of the original stickers did not survive. Even competitors like Fleer Crazy Labels and others are also increasing in value. What's your favorite Original Series? This web page will hopefully bring back some memories as well as provide useful information about Wacky Packages for general interest or collecting. I hope you enjoy this site. If you have any questions, comments or just want to tell some wacky stories, send me an e-mail or post it on the Wacky Packages Message Board. Eliminate web page advertisements with AdsOff!